The Toyo T1 Sport Tyre is a supremely capable tyre, designed and manufactured to meet the demands of ultimate handling in dry and wet conditions. 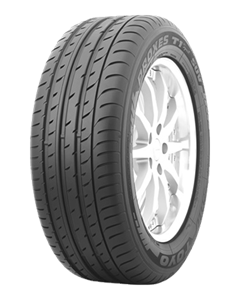 The T1 Sport tyre has been developed for European SUV vehicles, road and weather conditions and offers precise handling for country lanes and high speed stability for motorway driving. The outside of the tread pattern has been engineered for cornering performance - increased contact area from the wide ribs with a shallow and narrow groove to maintain a good contact patch with the road, offering improved handling with increased grip. The inside of the tread pattern helps with aquaplaning and braking - two wide grooves ensure excellent water drainage, and the rib based pattern configuration increases the tread's rigidity for better braking. The T1 Sport SUV also features wide straight grooves as water channels for better aquaplaning resistance.